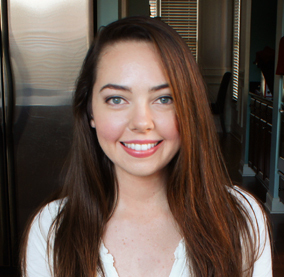 My name is Lauren, and I am a student, a foodie, and the author of The Healthy Indulgences Cookbook: A Guide To Baking All-Natural, Sugar-Free Desserts. I create sugar-free and gluten-free dessert recipes featuring all natural ingredients. During my time as an undergraduate at Duke University, I created these recipes to help me lose 30 lbs and cut back on the amount of processed foods I was eating. The goal of my kitchen experiments is to come up with recipes for lower carbohydrate desserts that are every bit as good as their sugar-laden counterparts. The delicious successes end up on this blog! My crack team of willing food testers includes family, friends, roommates, and hungry looking acquaintances. They help me to ensure that you too, have sweet success in the sugar-free kitchen! Since 2008, I have divided my time between blogging and managing life as a college student. It has been an incredible journey! The more I learn about nutrition science and weight loss, the more I realize how much I don’t know. Healthy Indulgences Blog receives many offers from brands and retailers to review their product samples. Some of these samples are sent to me free of charge, for consideration. When a product is sent to me “for consideration,” I test it out to see whether it is high quality enough to share with the readers of this blog. I do not accept financial compensation for reviews, but I do accept offers for sponsored giveaways, which are identified by a disclaimer in the giveaway post. Many of my posts feature affiliate links to iherb.com that give me a commission when you purchase the products. This does not cost anything to you, the consumer. I provide these links to generate revenue, and show you the most reasonably priced source for ingredients that I have come across. Thanks for the nice comment, Ashley! Happy you were able to find the blog again. Flax meal works with pumpkin! I absolutely love your recipes! I have to say that they have kept me feeling like a human being despite my dietary restrictions. Anyway, I am having a small dinner party on friday and was thinking of making the black bean chocolate cake or the blender yellow cake, and was just wondering how you think it might work if I were to use egg replacer? I personally am fine with eggs but I have two guests coming over that are vegan. Hi, Adam! Missed your comment the first time around. The cake would not work with an egg replacer. Hi I really am enjoying your recipes … Hope to try some soon. I also saw you lived florida . My family and I live in Lakeland. Florida . Thanks again for the good recipes. Hi, Leah! You’re a bit farther north from where I am on the gulf coast. Welcome to the blog! Looks like he does some great work. Wish I could join him on the show, haha! I do have a muesli recipe to share on the blog. It’ll be posted during the new year. 🙂 Thanks for reminding me of it! Hi Lauren, I’ve just purchased your book but for whatever reason I’m having trouble downloading it. Can you help please? I was just wondering if you ever thought about adding professionally made videos to your website to help compliment your existing content? I can help you do this for free. Feel free to e-mail me if you wanted to learn more. If I want to use sugar instead of honey or xylitol can you tell me what quantities to use for the chocolate cake and the frosting? Hi, Margot! The recipes posted have not been specifically tested with sugar and honey, but you are welcome to try your hand at experimenting with those sweeteners in the recipes! You can always taste the batter before putting in the oven to check for the proper level of sweetness. I just found out where to buy erythritol and pure stevia extract. Now, my question is does Whole Foods also carry the powdered version of each one? If not, where can I get that? Thanks. Paula, I missed your question about powdered forms of erythritol and xylitol. They do not carry the powdered forms, but you can do the grinding yourself with a Magic Bullet blender or coffee grinder. Hope that helps! Hi, Paula! I don’t think Whole Foods carries the large sizes, but they do carry the 1 lb bag of erythritol by NOW Foods. You might want to check and see if they still do carry that product by giving them a call. I haven’t lived near Whole Foods since 2011. They did carry NuNaturals stevia as well the last time I checked. You can get free shipping with my coupon code for Iherb and order stevia and erythritol at discounted prices there. Just click on the green Iherb banner on my sidebar, to the right. 🙂 Hope that helps, Paula! Hi Lauren!! So glad to find you and your great recipes…I have a quick question. Unfortunately, my youngest daughter has an severe allergy to erythritol, so she can not eat anything with that ingredient….what do you suggest I replace that with in your recipes? xylitol? Just like Sugar? Hi, Cheryl! Does she tolerate xylitol well? I cannot recommend xylitol in large quantities based on my experiences with it. Perhaps she can digest it without the gastric distress I experience after consuming it. Just Like Sugar contains chicory root which also tends to cause unpleasant side effects for me. You might want to check out my paleo recipes, or those from other bloggers, if your daughter can eat honey, bananas, dates, and coconut palm sugar. She might enjoy my recipes for Honey Nut Cookies, Gingerbread Cookies, and Quick Chocolate Mousse. Good luck finding the sweetener that is right for her, Cheryl! Sheriff Joe should release early, using the element of surprise, in law enforcement you catch em off guard and observe, or in war you then destroy them. Francesca Rana · lunedÃ¬, 8 ottobre 2012, 11:54 amRipeto quanto ho detto su twitter e fb. Grande lezione di etica professionale esemplare sul caso Ilva di Taranto. Fa rafforzare l’orgoglio di aver vissuto, da giornalista precaria, schivando i colpi di corrotti, corruttori, corruttibili. Profonda stima. Spero che altri giornalisti italiani imparino ad andare avanti, seguendo l’esempio di Gad Lerner, puntando ad una risoluzione, e non sguazzare nella guerra tra poveri riportando indietro le lancette del ragionamento. that quilt is coming to life with your quilting!now about the slides. can I ask how you converted them to digital? we have a similar situation and can’t stand the thought that the slides might eventually be lost. I am anna from shanyuan sanyuan biotechnology co.,ltd , the biggest erythritol manufacture of china . From your website , i found your company has the erythritol , so we want to check if have any chance to cooperate ? Could you please kindly forward this email to your purchasing manager ?? Thank you in advance.